Our trained engineers are ready to provide you with assistance using our software. If you are an existing customer, please submit a ticket using our Customer Support Portal. All other inquiries can reach us using our contact form or calling 703-657-0919. We provide training classes for all our software offerings. Classes can be hosted on-site at your business campus. Training courses may be customized to suit your requirements. They can be project specific, or more generalized for those wishing to expand or update their capabilities. We host regular webinars that are presented by our engineers that use the software. Webinar content ranges from general introductions of to in-depth tutorials. Subscribe to our mailing list to be notified of upcoming webinars. We provide answers to frequently asked questions regarding the licensing of our software. Includes questions on floating and node locked licenses. 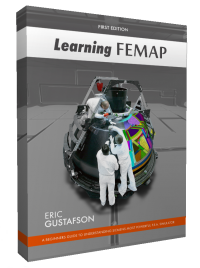 Eric Gustafson, one of our engineers, wrote a book on learning FEMAP. This book provides a comprehensive guide to every facet of this extensive software, for both beginners and advanced users.